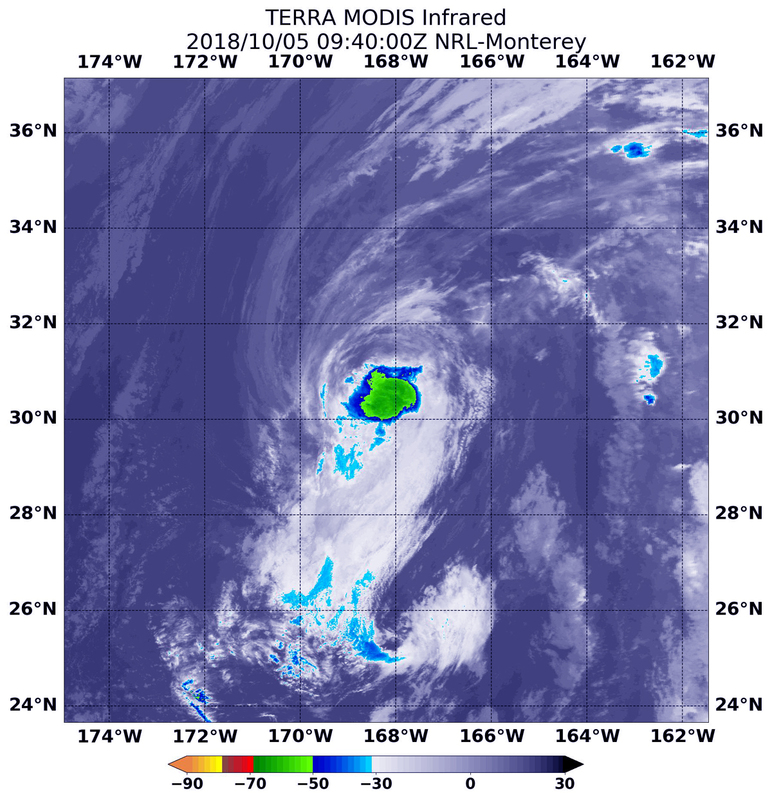 NASA’s Aqua satellite passed over the Central Pacific Ocean and obtained infrared data on Walaka, now weakened to a tropical storm with limited thunderstorm development. Infrared satellite data at 5:40 a.m. EDT (0940 UTC) on Oct. 5, the Moderate Resolution Imaging Spectroradiometer or MODIS instrument aboard NASA’s Aqua satellite revealed strongest storms with the coldest cloud top temperatures in a small area around Walaka’s center. MODIS found coldest cloud tops had temperatures near minus 63 degrees Fahrenheit (minus 53 degrees Celsius). NASA research has found that cloud top temperatures that cold have the capability to generate heavy rainfall. At 5 a.m. EDT (0900 UTC) on Friday, Oct. 5, the center of Tropical Storm Walaka was located near latitude 30.6 degrees north and longitude 168.3 degrees west. Walaka is about 480 miles (770 km) north-northwest of the French Frigate Shoals. Walaka is moving toward the north-northwest near 6 mph (9 kph). A turn toward the north is expected tonight, followed by an acceleration toward the northeast Friday through Saturday. Maximum sustained winds are near 70 mph (110 kph) with higher gusts. Some weakening is forecast during the next 48 hours. The Central Pacific Hurricane Center or CPHC said Walaka will be over cool sea surface temperatures through the remainder of its journey across the Pacific, with vertical wind shear expected to increase substantially Friday night and Saturday, Oct. 6. Steady weakening is forecast during the next 48 hours, and Walaka is expected to become a post-tropical low by Saturday evening. CPHC noted that ocean swells generated by Walaka will continue to affect portions of the Papahanaumokuakea Marine National Monument and the main Hawaiian Islands tonight, Oct. 5. NASA’s Terra satellite analyzed Hurricane Walaka in infrared light as continued to lash the Papahanaumokuakea Marine National Monument in the Central Pacific Ocean. NOAA’s Central Pacific Hurricane Center or CPHC said a Tropical Storm Warning is in effect for Papahanaumokuakea Marine National Monument from Nihoa to French Frigate Shoals to Maro Reef. Papahānaumokuākea Marine National Monument is the largest contiguous fully protected conservation area under the U.S. flag, and one of the largest marine conservation areas in the world, according to the monument’s website. It encompasses 582,578 square miles of the Pacific Ocean (1,508,870 square kilometers) – an area larger than all the country’s national parks combined. The name Papahānaumokuākea commemorates the union of two Hawaiian ancestors – Papahānaumoku and Wākea – who gave rise to the Hawaiian Archipelago, the taro plant, and the Hawaiian people. On Oct. 4 at 4:55 a.m. EDT (0855 UTC) the MODIS instrument or Moderate Resolution Imaging Spectroradiometer aboard NASA’s Terra satellite observed Hurricane Walaka and found powerful thunderstorms around the center of circulation. Infrared light that revealed cloud top temperatures were coldest as cold as minus 70 degrees Fahrenheit (minus 56.6 degrees Celsius). NASA research has shown that storms with cloud tops that high in the troposphere and that cold have the capability to generate heavy rain. At 5 a.m. HST (11 a.m. EDT/1500 UTC), the center of Hurricane Walaka was located near latitude 26.8 degrees north and longitude 166.5 degrees west. That’s about 200 miles (325 km) north of the French Frigate Shoals. Walaka is moving toward the north near 20 mph (31 kph). It is expected to slow its forward speed and turn toward the north-northwest later today and tonight. From Friday through early Saturday morning, Walaka is forecast to move toward the north-northeast at a faster forward speed. Maximum sustained winds are near 110 mph (175 kph) with higher gusts. Gradual weakening is expected to continue during the next couple of days, but Walaka is forecast to remain a hurricane through early Friday morning. An infrared look by NASA’s Terra satellite found a ring of intense storms around the wide eye of Hurricane Walaka in the Central Pacific Ocean. Walaka remains a dangerous category 4 hurricane on the Saffir-Simpson Hurricane Wind Scale. A Hurricane Warning is in effect for Johnston Atoll, the Papahanaumokuakea Marine National Monument from French Frigate and Shoals to Maro Reef. A Tropical Storm Warning is in effect for Papahanaumokuakea Marine National Monument from Nihoa to French and Frigate Shoals. On Oct. 3 at 5:45 a.m. EDT (0945 UTC) the Moderate Resolution Imaging Spectroradiometer or MODIS instrument aboard NASA’s Terra satellite analyzed cloud top temperatures in infrared light. MODIS found cloud top temperatures of strongest thunderstorms ringed around the wide eye. Those temperatures were as cold as or colder than minus 80 degrees Fahrenheit (minus 62.2 degrees Celsius). They were embedded in a large area that circled the eye where cloud top temperatures were as cold as or colder than minus 70 degrees Fahrenheit (minus 56.6 degrees Celsius). Cloud top temperatures that cold indicate strong storms that have the capability to create heavy rain. CPHC noted at 2 a.m. HST (8 a.m. EDT/1200 UTC), the center of Hurricane Walaka was located near latitude 18.9 degrees north and longitude 169.8 degrees west. That’s about 150 miles (240 km) north of Johnston Island. Walaka is moving toward the north near 14 mph (23 kph), and it is expected to turn toward the north-northeast with a faster forward motion later today and tonight. Maximum sustained winds are now near 140 mph (225 kph) with higher gusts. Some gradual weakening is possible starting from today or tonight through Thursday, but Walaka is forecast to remain a powerful hurricane when it crosses the Papahanaumokuakea Marine National Monument tonight. 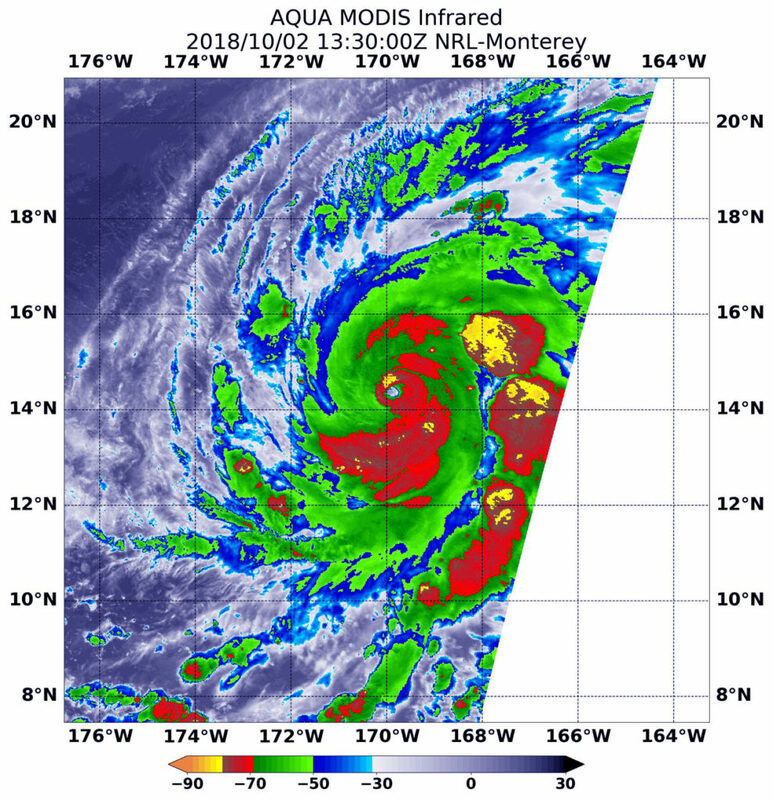 Infrared satellite imagery provides temperature data, and when NASA’s Aqua satellite passed over the Central Pacific Ocean, it analyzed Hurricane Walaka. Walaka is a Category 4 Hurricane on the Saffir-Simpson Hurricane Wind Scale. The Moderate Resolution Imaging Spectroradiometer or MODIS instrument aboard Aqua provided that infrared data on Oct. 2 at 9:30 a.m. EDT (1330 UTC) MODIS data showed cloud top temperatures in strongest storms around Walaka’s center and in a fragmented band of thunderstorms east of the center of circulation. They were as cold as or colder than minus 70 degrees Fahrenheit (minus 56.6 degrees Celsius). NASA research indicates very cold cloud tops with the potential to generate very heavy rainfall. 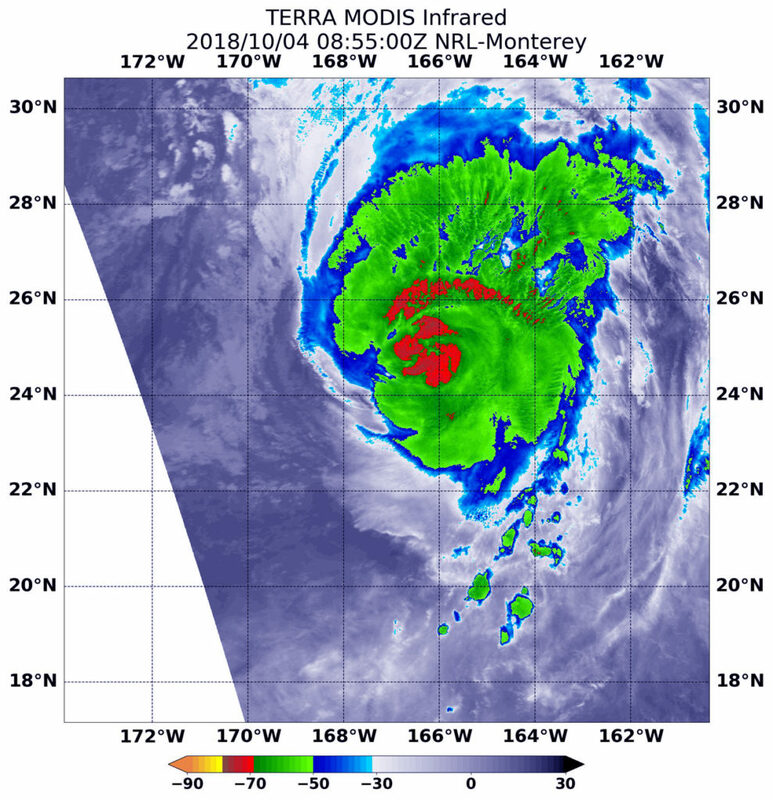 The Global Precipitation Measurement mission or GPM core satellite passed over the Central Pacific Hurricane Center and analyzed Walaka’s rainfall and cloud structure as it was strengthening into a hurricane. Walaka formed southwest of the Hawaiian Islands on Saturday, Sept. 29. At 5 p.m. HST on Sunday, Sept. 30, Walaka strengthened to a hurricane. The GPM core observatory recently had a couple good looks at tropical storm Walaka as it was intensifying into a powerful hurricane. 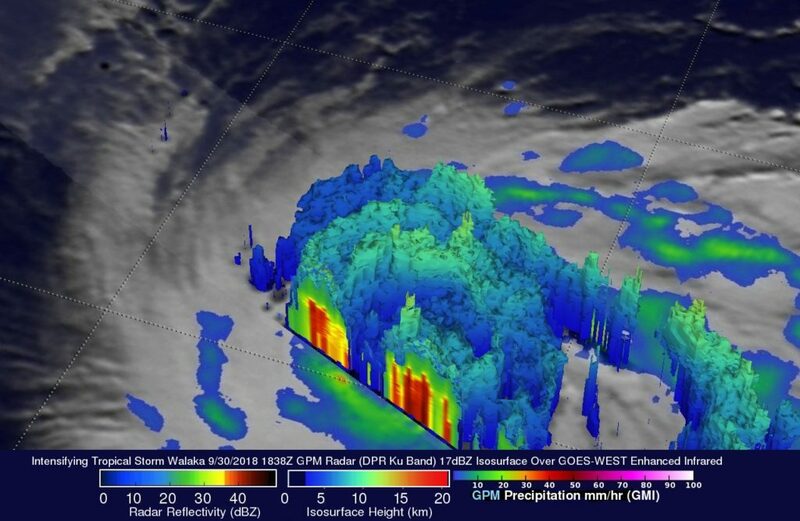 GPM passed directly over tropical storm Walaka when it was located south of the Hawaiian islands on September 30, 2018 at 8:38 a.m. HST (1838 UTC). Data collected by GPM’s Microwave Imager (GMI) and Dual-Frequency Precipitation Radar (DPR) instruments showed that Walaka was well organized and very close to hurricane intensity. GPM’s Radar (DPR Ku Band) data revealed intense convective storms in a large feeder band that was wrapping around the tropical storm’s northeastern side and storms wrapping around a forming eye wall. GPM’s DPR found rain falling at a rate of almost 6.5 inches (165 mm) per hour in the intense storms in the feeder band northeast of Walaka’s center of circulation. 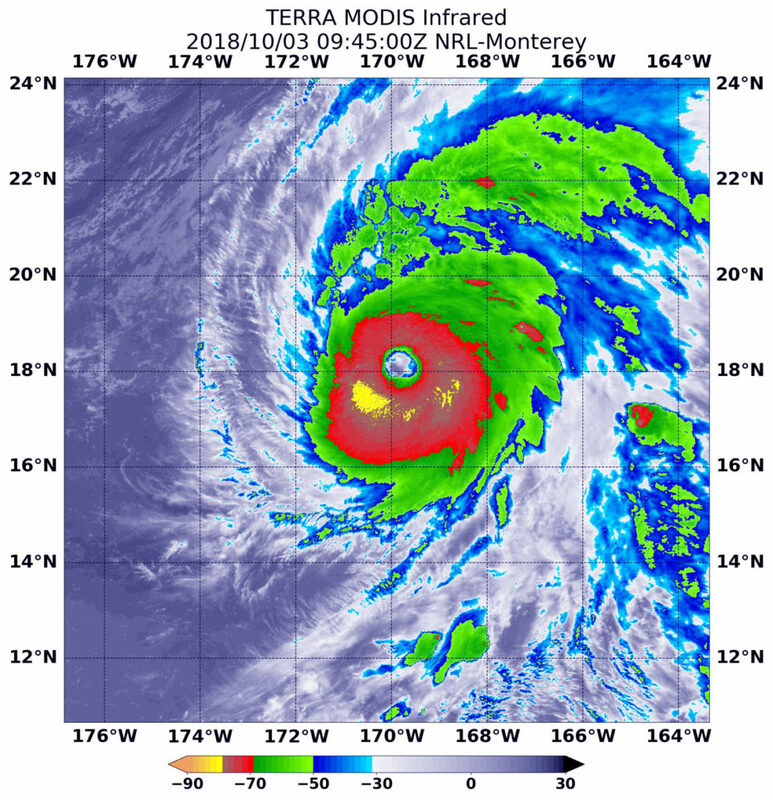 Walaka had strengthened to hurricane intensity when GPM flew above about twelve hours later at 8:07 p.m. HST (Oct. 1, 2018 at 0607 UTC). Walaka had developed an eye and was undergoing rapid intensification. The intensifying hurricane is passing well to the south of the Hawaiian Islands. The GPM satellite’s Dual-Frequency Precipitation Radar (DPR) data were used to show the structure of precipitation within intensifying tropical storm Walaka. The simulated 3D view of Walaka, looking from the southwest, showed storm tops of powerful storms wrapping into the center of the tropical storm. A tall convective storm was located in a line northwest of Walaka’s center. It was found by DPR to reach heights above 8.5 miles (13.7 km). GPM is a joint mission between NASA and the Japanese space agency JAXA. On Monday, October 1, 2018, NOAA’s Central Pacific Hurricane Center or CPHC noted that a Hurricane Warning is in effect for Johnston Atoll. Also, interests in the Papahanaumokuakea Marine National Monument should monitor the progress of Walaka. At 5 p.m. HST/11 p.m. EDT (0300 UTC, Oct. 1) on Sept. 30 or , the center of Hurricane Walaka was located near latitude 11.9 degrees north and longitude 166.4 degrees west. Walaka is moving toward the west near 12 mph (19 kph) and this motion is expected to slow and become northwest on Monday, then north on Tuesday. Maximum sustained winds are near 75 mph (120 kph) with higher gusts. Rapid intensification is forecast through Tuesday. The Joint Typhoon Warning Center (JTWC) predicts that Hurricane Walaka will continue to strengthen and re-curve to the north later today. Walaka is expected to be a powerful category four hurricane on the Saffir-Simpson wind scale when it passes just to the west of Johnson Atoll in a couple days. Walaka is not expected to have a significant effect on the Hawaiian Islands.